KSDP Group has appointed Richard B Roolvink as managing director of its Amstersdam office, with effect from 1 January. Mercier Gray, a marketing company specialising in design, has come up with an alternative way to win new business. After months of painstakingly searching for a career opening, I had the good fortune to be offered my ideal job. 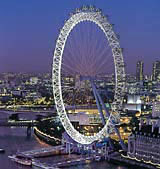 Futurebrand is developing a visitors centre for the British Airways London Eye, the giant wheel on London’s South Bank. Landor rebrands JAS Indonesian airport handling services group Jasa Angkasa Semesta has been rebranded by the Hong Kong office of Landor Associates.